Is there any other reason to go to the races, than to tailgate?! 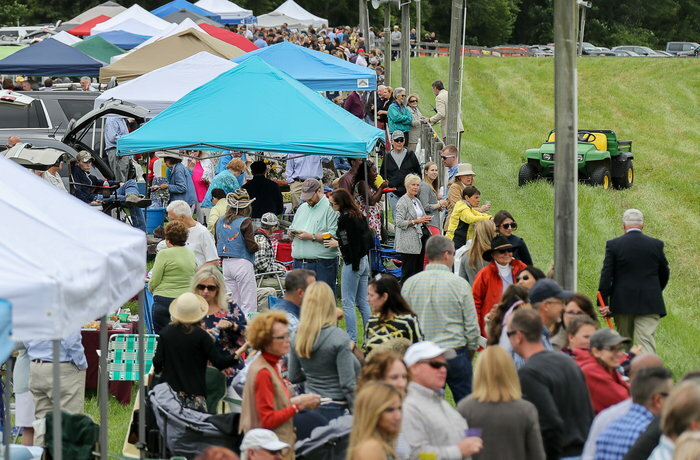 From catered feasts to tiki bars to picnics...the hunt races has it all. You're only limited by your own creativity and the guests you invite. You can bring your own food and libations or purchase them from vendors on site. The best opportunity for tailgating is with a railside parking space. You must reserve them in advance, as they are limited, and in high demand. Well-secured canopy tents are common. Please make sure yours will fit within the 11 feet of fence line allocated to each railside parking space. Bring 4-wheel drive vehicles if you've got them. In case of rain, the races go on, but your car might not. Potomac Hunt will assist in getting cars out, but it might take some time, so plan ahead if you can. No dogs except service dogs. Please keep the horses and riders and our guests safe by leaving your dog at home. No ATVs, dirt bikes, golf carts, etc. will be allowed entry at the races. For everyone's safety please leave them home.